This summer I finally decided to try 3d modeling after reading an article in Wired magazine that laid out the process. I looked for an open source CAD program that would be straightforward to use, and that matched my design approach. I found openSCAD, which was perfect for me. openSCAD lets you write instructions for your designs, which I much prefer to designing with a mouse. Some aspects of openSCAD take some experience to understand, but it is still relatively easy to get started with the program. My first project with openSCAD was a holiday ornament based on the Koch snowflake fractal. It was a very satisfying project, which pushed me to learn a number of different aspects of working with openSCAD, and doing 3d design work in general. This introduction will focus on something simpler than this project, because fractals get fairly difficult unless you have some programming experience. This entry was posted in modeling, openSCAD and tagged 3d modeling, holiday ornament, koch snowflake, math, openSCAD. Bookmark the permalink. Hi, just stumbled upon your blog when searching for fractal examples applied in OpenScad. But I was glad to see that we have same interests: mountains in addition to Tech. 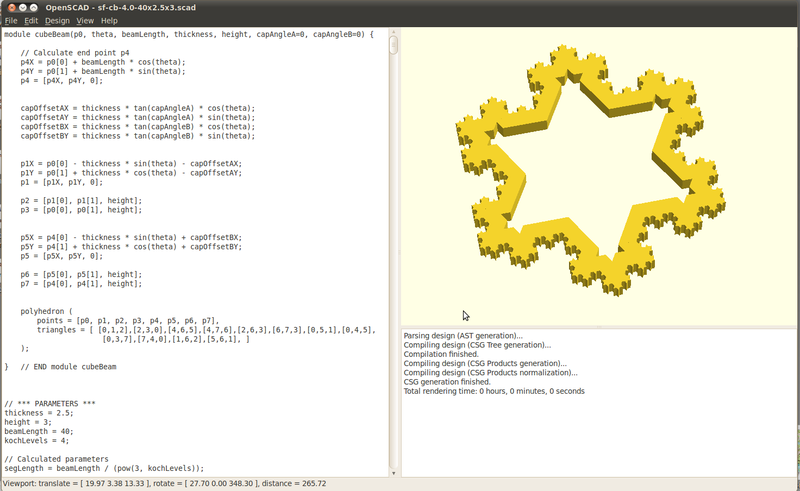 I really like OpenScad, but it was not easy to build a fractal in openscad by itself. Parameters are not mutable in openscad, so they are not true variables. When openscad compiles your modeling code, all instances of a parameter take on the last value calculated for that variable (if I remember that correctly). I ended up writing a script in Python that generated openscad code to create a fractal. Knowing both languages, it wasn’t very difficult. There is a python wrapper for openscad, but I didn’t bother to use it in this case. If I were doing another fractal project, I would probably look for that wrapper. Going to the mountains is a great way to balance technical work! I like to go to the mountains, scare myself with the steep so much that I don’t ever want to go to the mountains again. At that point, all I want to do in the world is sit in front of a computer and build things. Then the weather clears, and I forget the fear, and it starts all over again. Not a bad life! I am an experienced designer with Solidworks, but I know how OpenSCAD works and I am awed when I see things like this created with it. Bravo.